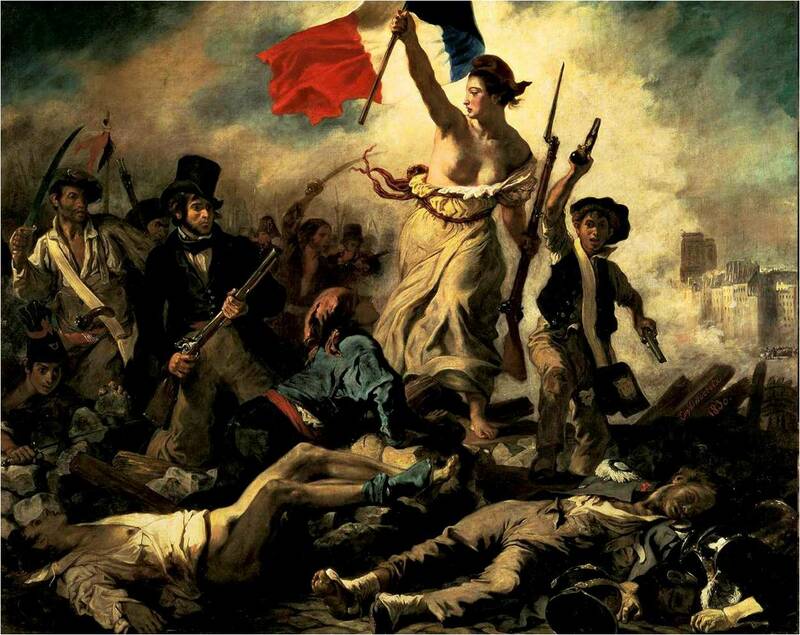 Delacroix’ Liberty Leading the People. She – Liberty – is so much more than the country: she is the ideal and the aspiration, the unadulterated guiding principle. Her path remains clear; but have the people stopped following her? As Francois Hollande transitions from the bureaucratic administrator of the Fifth French Republic to a wartime leader in the latest instalment of the rolling war on terror, decisions are being made about France. The latest pronouncements – from overbearing surveillance measures introduced in the Summer in the aftermath of the Charlie Hebdo killings, to the most recent introduction of a three month state of emergency in order to deal with the Paris attacks – diminish democratic governance and accountability, in the short-sighted interests of expediency and national security. But this disaffected progression is not new; perhaps the January and November attacks were more overtly offensive than before, and appear more obvious inflection points, but we must go back ten years to the riots of 2005 to try and understand what is happening. Furthermore, the decisions being made today are not merely reflective of missteps taken in the past, but instructive as to the kind of France that is emerging for the future. And for France, we can read Europe, and Western Liberalism. France is a special case, more than just a country, more than just a nation. In so many respects, western liberalism was born here. Plato’s Republic was an aspiration, and an exclusive one at that. But blood was spilled on the streets of Paris for the modern state. It may be the fifth republic, but France has been governed for two hundred years – excepting the Vichy aberration – by the Enlightenment principles of liberté, égalité, fraternité – freedom, equality, solidarity. We are all human, we all aspire to be free, we are collectively pursuing the same objectives. That pursuit – Americanised perhaps as the pursuit of happiness – defines us ideologically, personally, and politically. The path has not been an easy one. Human weakness – in the form of selfishness, cynicism and a naked will to power – have threatened to derail the liberal hegemony, only to give way to a re-affirmation of these core principles such as in the architecture of the United Nations and the European Union amidst the giddy optimism of the post-war years, and again upon the fall of the Berlin Wall and the defeat of Communism, the (hubristic) neo-conservative end of history. Western Liberalism has never been under greater threat, however, than it is today, a victim in some respects of its own success. For its enemies are within. Without an externalised opponent, it has not been necessary to constantly refer back to founding principles. It has not been necessary to maintain and elevate national identity, to cherish the decisions that were made by people to govern ourselves this way. On the contrary, it has become important to be respectful and inclusive, to avoid arrogance and supremacism for fear of alienation and the creation of a new monster, a new other. We trip over ourselves about crucifixes and headscarves in classrooms, we make a nonsense of human rights by acceding to the demands of “minorities of one”, and college campuses fear the teaching of anything remotely visceral lest it offend. Suddenly, perhaps without realising it, persecution has become our defining politics, in its avoidance, defence and prosecution. Freedom of speech our highest right – for what is existence without expression? – and yet offensiveness is similarly elevated as our highest crime. We at loggerheads with ourselves. Both the defence of freedom of speech, and the prosecution of ‘hate crimes’ are the apotheosis of our civility. This is what we are now defending. This is the miasma into which wades the Islamist offender, at once bemused by our pagan lack of conviction, and enraged by our blithe permissiveness. The response to the terrorist attacks of the last decade or so has been to dismantle the edifice of the western liberal state. International Law fell almost as quickly as it had been established, and national constitutional law has similarly been undermined, such as in France today where unwarranted search, arbitrary house arrest and virtually unrestricted computer access are now permissible for the next three months under the State of Emergency. One wonders what will stop that period being extended, for it is unlikely that the threat will have been eliminated upon its expiration. The building blocks of justice and equity, loosened in the war on terror, fell away in Europe in the financial crisis when capitalist technocrats impassively stripped sovereign dignity from nos fréres in Greece, and Portugal, and Italy, and Spain, and reallocated resources not with solidarity, but with discrimination. This latest transgression is not exactly out of the blue. The Idea of France is certainly one of freedom, equality and solidarity. But it is also a practical, pragmatic Idea, one that eschews hereditary authority, and arbitrary or religious power. Critically, it embodies political accountability and the rule of law. These things have been diminishing over time, though France itself has perhaps held out longer than most; she famously stood firm in the face of US aggression in Iraq, and was vindicated for that. Even after the Charlie Hebdo attacks in January, the response was one of calm assuredness in the righteousness of the Idea. But not now. The defeat of fascism and World War II brought about the first re-affirmation of the Idea of France. The end of the Cold War and the fall of the Berlin wall brought about the second. It is to be hoped that there will be a third re-affirmation of the principles that mankind should represent, for it is badly needed. The fear should be for what will precipitate it. ‹ The Data Commodity: Fetish or Fiction?